The media has spent a lot of time talking about the future of the Los Angeles Lakers and their potential offseason signings. But the way this team is playing this season, all media outlets should be talking more about their present. This year’s Lakers have been tremendously fun to watch and are worthy of as much appreciation for what they are right now. Wednesday night the Lakers, who had nothing but pride to play for, won an overtime thriller 122-112 against a much more desperate San Antonio Spurs team, despite the fact that both Brandon Ingram and Lonzo Ball were out. Just the night before both players had played in Utah in a game the Lakers lost 117-110. 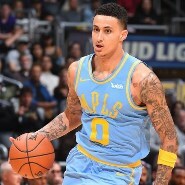 Kyle Kuzma was tremendous against the Spurs, finishing with 30 points in 44 minutes including a great overtime performance (scored seven of the Lakers’ 14 overtime points) that helped the L.A clinch the game. Julius Randle continues to shine this season as he keeps proving that this team should stop contemplating a future without him. Randle is an absolute bully in the paint and judging by the way he’s playing right now the Lakers would be foolish to let him walk away. Lonzo Ball continues to improve on all aspects of his game and has continued to show mental toughness by not letting the antics of his extravagant father derail his concentration and his season. Yes, the first half of the season was particularly tough for the rookie, but he’s become a key piece in the Lakers lineup. Even though the Lakers right now are not a playoff team they are still playing for every win they can muster because since they won’t keep their own draft pick this year they have never been interested in tanking. Unlike many other teams out there that aren’t trying hard enough night after night, the Lakers are one of the very few non-playoff teams that still are interesting and fun to watch and that in the end benefits both the development of their players, their locker room culture and their paying fans. So, stop waiting and talking about their bright future and appreciate the Lakers for what they are, and have been, this season.